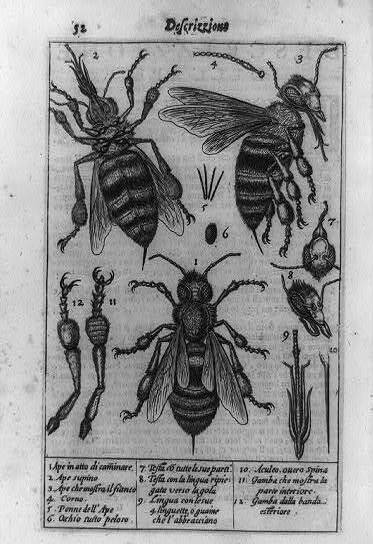 Engraving of the external anatomy of a bee shown in three full views and various details with key at bottom, circa 1630. It was a beekeepers’ national convention held in the mid-1870s, and the person who was about to speak was an Iowan. Her name was Ellen S. Tupper. She was known as the Bee Queen of Iowa. Ellen had moved to Washington County, Iowa, in 1851 with an invalid husband and needed to find a way to earn a living. She tried teaching, taking her new baby on horseback to school with her. But in 1857 she turned her attention to studying bee culture and began to raise bees herself. In 1865 she became widely known when she wrote a series of articles about the art and science of bees. By 1872 the Tupper family had moved to Des Moines where Ellen opened the Italian Bee Company and began to import queens and “a few choice” colonies from “the best apiaries of Italy.” She offered them at “low prices” and shipped to “any part of the country.” She also sold honey extractors, hives, and books on beekeeping. She lectured at the State Agriculture College in Ames and edited The National Bee Journal and The American Bee Journal. She became a paid contributor to the New York Tribune on the topic. Ellen advocated beekeeping as a suitable business for women. “Females are just as capable of looking after and taking care of bees as the male,” she said. She said raising bees gave women the opportunity to spend time in the outdoors, which benefitted their general health. All seemed to be going well for this enterprising businesswomen when word began to circulate that she had been forging signatures of prosperous businessmen in the state in order to secure loans. In February 1876 Ellen was arrested in Monticello, where she had “negotiated about $2,000 worth of notes” bearing the forged signature of a Dubuque businessman. She was transported to a Davenport jail, where she awaited trial. A year later in February 1877 Ellen went to trial entering an insanity plea. A “large number” of witnesses testified that she was an “irresponsible person.” One offered this assessment of Ellen, “Two years ago she broke down in both body and mind from overwork and passed through a long time of sickness and nervous prostration.” In March she was acquitted on grounds of insanity. “Whatever you hear that is bad about the division hospital—do not discount it,” Evelyn Belden of Sioux City warned. She had recently returned from a month’s visit to the US Army’s Camp Thomas at Chickamauga, Georgia, in the fall of 1898.